Government departments across Whitehall demonstrate their continued support for the Armed Forces to kick off week of celebrations. A soldier of 16 Medical Regiment waving the Armed Forces Day flag to show their support. 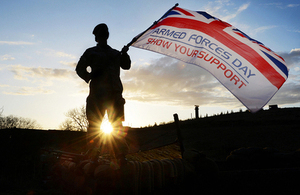 Armed Forces Day is an opportunity to do two things. Firstly, to raise public awareness of the contribution made to our country by those who serve and have served in Her Majesty's Armed Forces, Secondly, it gives the nation an opportunity to Show Your Support for the men and women who make up the Armed Forces community: from currently serving troops to Service families and from veterans to cadets. Today, ‘Fly the Flag Day’ marks the start of a week of celebrations to recognise the Armed Forces, beginning in Whitehall with Government buildings raising the Armed Forces Day flag to signify their support for the three Services. For the next week Government departments will be flying the flag as a beacon of how they work to support the Armed Forces in a variety of different ways, and demonstrate the dedication to continue their support as set out in the Armed Forces Covenant. The Armed Forces Covenant provides assistance to personnel, veterans and families and states that these parties will not be disadvantaged as a result of sacrifices made in serving their country when accessing goods and services compared to other citizens. To balance this, the Armed Forces Covenant has put into affect such schemes as Forces Help to Buy, which helps members of the Forces and their families to borrow money to buy their own property; the continuous education allowance, which ensures that children aren’t disrupted in their education should their parent be deployed or stationed elsewhere; and the Career Transition Partnership, an organisation set up specifically to assist Service leavers in finding employment outside of the Forces. In addition to Government departments the Armed Forces Covenant is also signed by businesses and local authorities across the country. Today, two of Britain’s highest profile employers have pledged their support to the Covenant; the AA and Lloyds Banking Group. The AA previously signed the Covenant in 2013 and is re-iterating its pledges today to mark a redoubling in its efforts and commitments to support the Defence community. These pledges include supporting the wounded, injured and sick with insight days, jobs and placement opportunities, and supporting Service leavers by recruiting from the Armed Forces community. The AA signing will take place on 22 June with the Vice Chief of Defence Staff and the AA Chairman and President who will be accompanied by AA reservists. The Lloyds Banking Group will also sign the Armed Forces Covenant today. 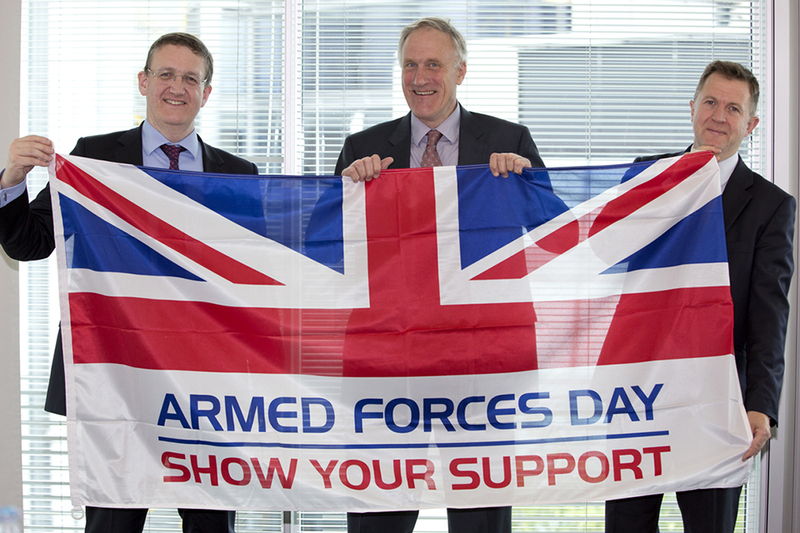 Reserves Minister Julian Brazier will countersign the pledge alongside several of Lloyds Banking Group’s directors. Their pledges include to support the employment of veterans both young and old; to work with service charities to help veterans with employability skills; and to actively support employees who serve in the Reserve Forces. Rupert McNeil (Group HR Director) and Matt Young (Group Corporate Affairs Director) of Lloyds Banking Group with Minister for Reserves, Julian Brazier, after having signed a Corporate Covenant at lunchtime today. We are incredibly proud of the Armed Forces Covenant and the positive, lasting impact that its schemes are having on our personnel and their families. Since the Armed Forces Covenant was enshrined in law in 2011, we have committed over £150 million, and this year have confirmed a permanent commitment of £10 million a year. Despite these achievements, we are not complacent and recognise there is more that can be done. Military life can often have its challenges and, for our personnel, often means putting themselves in harm’s way which can result in injury and potential difficulty in integrating back into civilian life. For families, military life can mean having to move around the country every few years affecting places on NHS waiting lists, children’s schooling, partners finding jobs and getting credit or mortgages. It is for those reasons that the security the Covenant offers is so vital to our Armed Forces who, due to the sacrifices they make in serving their country, deserve our support and appreciation. I look forward, in my role as Defence Minister, to work on building and strengthening the Covenant to make it even more relevant and accessible to our personnel. The Armed Forces Day Flag. Armed Forces Day is an opportunity to raise public awareness of the contribution made to our country by those who serve and have served in Her Majesty's Armed Forces. Also, it gives the nation an opportunity to 'Show Your Support' for the men and women who make up the Armed Forces community: from currently serving troops to Service families and from veterans to cadets. Guildford, host for this year’s Armed Forces Day National Event, will also conduct a flag raising ceremony at the iconic Guildhall which will involve the Royal Navy, Army and the Royal Air Force. 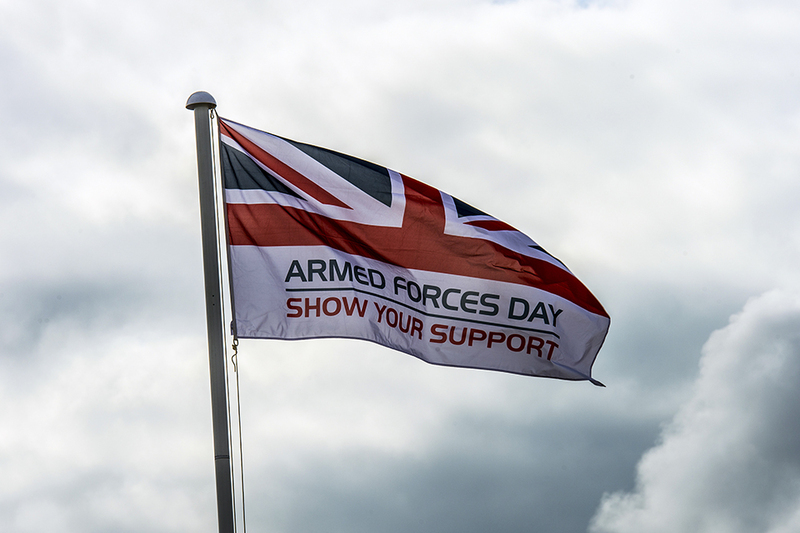 Around the country Local Authorities, town and parish councils and communities large and small will fly the Armed Forces Day flag, showing their support for our Servicemen and women, and for the wider Armed Forces community of families, veterans and cadets.